If you’re at least halfway interested in a six disc box set of bootleg material, there’s every chance you’re familiar with the lion’s share of their studio output and so detailed breakdowns of the actual songs aren’t really necessary. When approaching a set such as this, it’s whether the quality is any good that counts. Like the similar seven disc Glenn Hughes box set issued in June 2018, the quality varies throughout. In some cases, using the ‘Official Bootleg’ title perhaps even implies the quality is glossier than it is. That’s certainly the case with the first featured gig. ‘Live At Abbey Road, Lubbock 1984’, is not so much official bootleg as actual bootleg. Without the luxury of a recording off the sound man’s desk, fans will have to make do with something that sounds like it has been recorded on a Walkman in a shifty guy’s pocket. Audience chatter is reasonably audible during the quieter moments while, in general, the band sound like they’re playing from the end of a corridor. However, if you can get past the rough sound, the performance itself is absolutely storming. The opening flurry of tracks – ‘Too Young To Die’, ‘Hiroshima Mon Amour’ and ‘Big Foot’ – sound as if they were strong performances on the night, but the recording captured here is so raw, you might spend most of that time trying to attune your ears to the finer points. Of particular note is a fantastic take on ‘Kree Nakoorie’ with Yngwie indulging in some extended bluesy solos. His melodic side interspersed with intricate picking very much looks forward to his career masterpiece ‘Odyssey’ and in that album’s instrumental showcase ‘Kraktau’, in particular. Seguing into a six minute guitar solo where the Scandinavian shredmeister indulges in something that, at first, is a blatant homage to Ritchie Blackmore’s neo-classical fascinations only lifts this show to higher heights, before descending into busy, metallic workouts, peaking with a tapped section. The more AOR-centric ‘Island In The Sun’ exposes a few ropey backing vocals and an overly loud keyboard, but Bonnet seems in more than reasonable voice; the softer ‘Suffer Me’ is sometimes marred by audience chatter, but Bonnet puts in an absolutely stellar performance, and a take on the Michael Schenker Group’s ‘Desert Song’ is tackled with absolute force, turning out brilliantly – at least musically speaking. The recording, on the other hand, damages the performance: after the intro, the person responsible for recording this show appears to tweak something and the volume drops dramatically. On the plus side, the less echoey sound allows more bass to be heard, along with a few subtler elements of the performance (not that Alcatrazz could ever be called subtle, to be fair), but Graham’s voice all but disappears. After a couple of verses, something else is fiddled with and the vocals return. The sound is similar to before, but sounds better somehow. Various sound gremlins aside, this is actually one of the show’s highlights. Graham’s short tenure in Rainbow gets a reasonable look in at this ’84 show, too, with three cuts from ‘Down To Earth’ featured. The mega hit ‘Since You’ve Been Gone’ comes across as a bit heavy handed in Malmsteen’s hands, but ‘All Night Long’ manages to capture the power of Alcatrazz on a number familiar to most, even if the distorted recording and Bonnet pushing his voice makes it hard listening in places. The most interesting is the rendition of ‘Lost In Hollywood’: one of Rainbow’s more aggressive numbers, Alcatrazz take it and run with it. Malmsteen is in full shred mode filling various spaces with lightning speed flourishes, clearly trying to steal the show from Bonnet throughout. You’d think he’d be a bit more tasteful considering he loves Blackmore’s work so much, but then again, it’s Yngwie…so maybe not! A second show entitled ‘Texas Sentence’ (with no further details given) features, essentially, the same material. Another recording with from a rough and ready source, it sounds marginally better than the Abbey Road show at first, but the first track has a couple of major problems. After a minute or so of ‘Too Young To Die’, the tape abruptly cuts to the second half of ‘Big Foot’ – suggesting that ‘Hiroshima Mon Amour’ was played between but not recorded – and the taper can subsequently be heard shouting into his equipment, in a soundcheck-like manner. This really is for the most ardent Alcatrazz fan. From then on, though, things are smooth, provided you’re happy to excuse the bootleg recording. ‘Island In The Sun’ comes across a bit better than at the previous show and although essentially following the same path as before, the ‘Kree Nakoorie’/’Guitar Solo’ double whammy doesn’t seem quite as flashy…at least start with. Alcatrazz have you under false pretenses though, since by the time Malmsteen reaches the second part of his solo, he’s truly on fire – making this previously unavailable recording worth adding to the collection. The rendition of ‘Since You’ve Been Gone’ is better, too – far more melodious and a step closer to the Rainbow live performances from a few years earlier. ‘Desert Force’ is, again, by turns heavy and melodic, with Graham adopting the role of a scenery chewing rock vocalist before the bluesy interlude shows off a great guitar tone – or as much of one that this no-frills recording allows. An incomplete ‘Evil Eye’ and the closing double-whammy of Rainbow tunes provide a more than suitable climax to what sounded like a great show. The version of ‘All Night Long’ is particularly spirited, possibly outdoing ‘Lost In Hollywood’ on this occasion. Granted, it’s not a patch on any of the Rainbow performances, but it’s preferable to Graham’s butchering of it with Blackthorne in the early 90s. Spread across the remainder of discs 1-3 are various works in progress from the 1985 writing sessions that spawned the ‘Dangerous Games’ album. ‘K9’ is an unfinished instrumental full of stabbing keys that sounds like a TV theme for a US action series; a second instrumental titled ‘Stand By Me #1’ presents a wash of 80s keys and a performance that sounds like a rehearsal by an average wedding band playing the Ben E. King hit (although it isn’t entirely clear that this is that track at times) and a writing demo for ‘Undercover’ (a standout track from ‘Dangerous Games’) shows the classic track in a very early form, little more the basic skeleton of the song’s final melody played on Jimmy Waldo’s keyboards and a choppy guitar. Another brief snippet offers an isolated recording of that track’s background vocals and, again, is interesting if you’re a fan of the album, and the same could be said for two basic backing track tunes labelled ‘Danny & Jimmy’. Early demos of ‘Dangerous Games’ and ‘Double Man’ are well formed although lacking vocals, and in the case of the latter, the recording shows how crunchy the track could have sounded if only Jimmy’s keys had not been turned up to the max and Danny Johnson’s guitars not been so understated on the final album version. Finally, a couple of tracks tagged ‘Writing Ideas For Dangerous Games’ offer various sketches and snippets that might only be good for one listen, but for the Alcatrazz fan, these twenty minutes are a welcome fly on the wall insight into how early ideas (mostly for ‘Undercover’) evolved during those more commercial days. 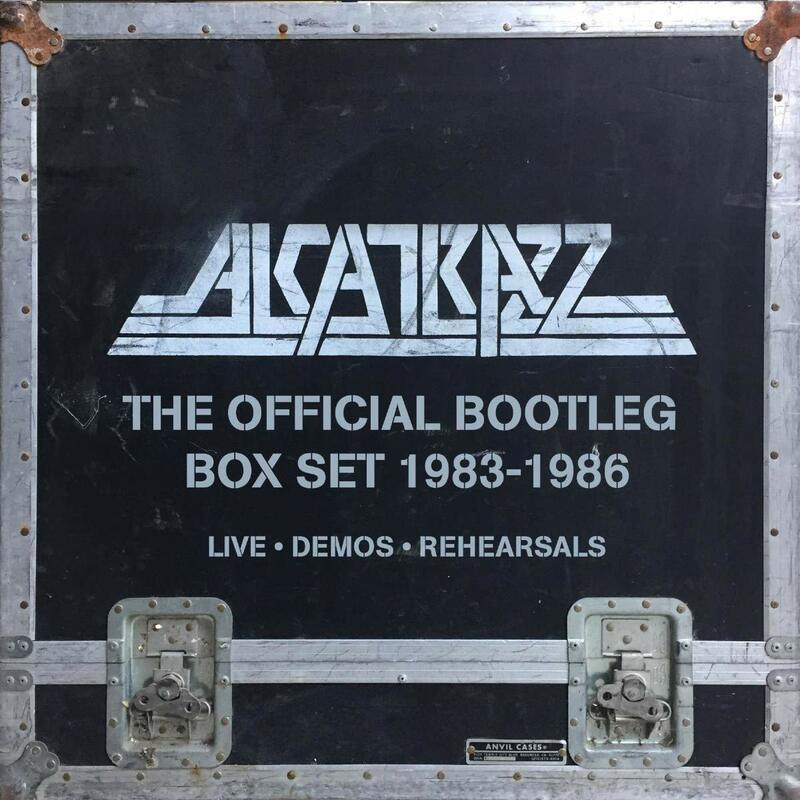 Moving away from audience sourced live material, discs 4-6 feature a plethora of rehearsals and leftovers, very much geared towards the most obsessive Alcatrazz fan. From these three discs of leftovers, it’s disc four that’s the most essential, presenting – among other things – a completely instrumental version of the ‘No Parole’ album. Make no mistake, these ten tracks aren’t the ten instrumental demos from the 2009 deluxe edition of the album; they’re much better sounding. Aside from a little tape hiss, they’re almost up there with the finished article and for those who love early Alcatrazz for Malmsteen’s work rather than Bonnet’s vocal, these tracks are the ultimate in unearthed treasure. Even with a few seconds of ‘Jet To Jet’ having been erroneously recorded over on the original archive cassette, it’s all brilliant – as good a reason as any to own this box set. Elsewhere you can experience a two complete rehearsals from 1983, the first of which manages to sound crisper than the audience sourced live shows. It’s probably got a lot to do with where the microphones are positioned, but it’s a genuine contrast to the norm to hear Jan Uvena absolutely powering behind the drum kit and Waldo laying down slabs of Don Airey style keyboards, whilst Yngwie is barely audible. Listen carefully, he’s there, but it sounds like he’s in a different studio and bleeding through. During this rehearsal, there are three very energetic instrumental run throughs of ‘Jet To Jet’ and also equally tight rehearsals of ‘Hiroshima Mon Amour’, ‘Kree Nakoori’ and ‘Starrcar Lane’, all of which really show off the power of Alcatrazz as a live unit, despite Graham’s absence. The second rehearsal is a little rougher and sounds more like the live shows, but again, the energy is there for all to hear. ‘Jet To Jet’ comes across like a real tour-de-force, even with the tape showing signs of wear. ‘Big Foot’ appears in three configurations: one features an almost complete take, but is bolstered by incomplete parts. During the second, it’s pleasing to hear a clearer bass from Gary, before the third offers little variation beyond a couple of false starts. By the end of approximately fifteen minutes’ worth of ‘Big Foot’ tapes, the fatigue of listening repetition sets in, but Alcatrazz’s commitment to getting it right is clear enough. After a couple more false starts – the usually more tuneful ‘Island In The Sun’ is actually bit lumpy. Without Graham’s vocal accentuating its more commercial feel, it’s not often more than a mid-paced rocker with heavy keys. It’s unfortunate that Yngwie is barely audible in places once again, since during ‘Starrcarr Lane’ he sounds as if he’s playing his arse off, while the devastatingly loud Waldo and Uvena are just laying down the bones of a fairly bog standard rock tune. ‘Horishima’ and ‘Kree Nookorie’ might be highlights of the early live set, but the presented rehearsal takes add nothing of great interest to this box set. Yngwie is high in the mix, but in many ways, these tracks don’t sound so different from the superior instrumental takes featured elsewhere. The brief ‘Incubus’, likewise, shows that he’s just as capable of a fluid neo-classical hundred notes a second approach when playing live as he is on a perfected studio recording. This second rehearsal features one performance from Bonnet, as he tests out a vocal for ‘Suffer Me’ and once the sound levels sort themselves out, he’s in good voice…and particularly so during the quieter notes. Nearing the end of this very live sounding recording, there are two run-throughs of Graham Bonnet’s ‘S.O.S.’ [as originally featured on his 1981 solo LP, ‘Line Up’] used as audition pieces for ex-Wings guitarist Laurence Juber [miscredited as Lawrence Juber] and a guy named Jon Hyde. More substantial are a few instrumental demos for songs from ‘Dangerous Games’, which are pretty much as you’d expect: more commercial and relatively polished, giving a huge insight into some almost finished arrangements. These are certainly a welcome companion to the earlier instrumental ‘No Parole’ tracks. The biggest gem from this disc of demos, though, is an all-but finished tune called ‘You Can’t Take The Rock Out of Roll’, which replaces Alcatrazz’s usual bombast with something that sounds more like Tangier or Bernie Marsden. With new boy Danny Johnson offering a slightly bluesy and more commercial style and also handling lead vocals, it could even be the work of a different band entirely. It sort of goes without saying that this set is for the fans – and pretty much only for the fans. The live gigs are pretty rough and a lot of the rehearsals are of limited interest. In terms of individual elements, it’s only the instrumental ‘No Parole’ that has any hope of catching the ear of any other passing listeners – the best bits of those recordings are almost as good as parts Malmsteen’s solo albums from the 80s. There’s nothing here from Steve Vai’s tenure either, but somehow, despite bad sound and a rag-bag nature, the box set works quite well as a whole. It does suffer a little from quantity over genuine quality in places, but if you’ve bought other live releases by Alcatrazz or are perhaps keener on Graham Bonnet than most sane people, you’ll certainly want this in your collection. This entry was posted in Album & EP Reviews and tagged 80s, alcatrazz, cherry red records, graham bonnet, hard rock, hear no evil records, metal, official bootleg, yngwie malmsteen by Real Gone. Bookmark the permalink.